On 30th October, Sander Begeer is giving a seminar on “Training Theory of Mind in Autism” at the Department of Cognitive Science, Macquarie University. Speaker : Sander Begeer, School of Psychology, University of Sydney. Deviant perspective taking or Theory of Mind (ToM) skills are a central feature of autism. However, the literature is unclear about specific strengths and weaknesses of individuals with autism. This is partly due to the way ToM is measured. Moreover, many treatments for children with autism involve attempts to ‘train’ ToM skills, while the evidence base for these treatments is generally poor. In the current presentation, the effects of training ToM in children with autism will be discussed, with specific regard to passive or active social interaction styles of the children. The difference between conceptual and applied ToM skills is highlighted, and the question is raised whether ToM is a proclivity, rather than a capacity. Bio: Sander Begeer is a postdoctoral fellow, working on University of Sydney Postdoctoral Research and Endeavour Award Research Fellowships. His research focus is on autism, empathy and social emotional development. He is involved in various projects that highlight the assessment of social emotional problems in autism, the effect of treatment for some of these problems (Theory of Mind and emotion regulation), and the assessment of autism in ethnic minorities. 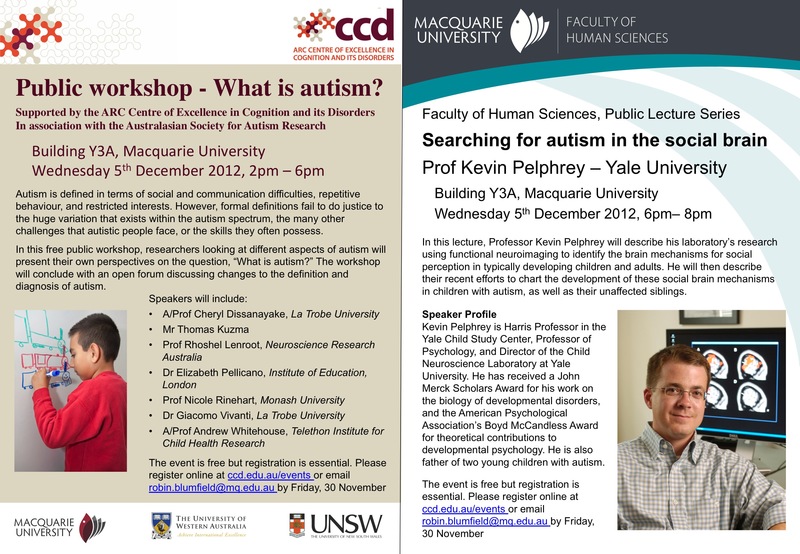 The inaugural conference of the Australasian Society for Autism Research (ASfAR) will be held at Macquarie University, Sydney on 6th – 7th December 2012. The conference will be free to all ASfAR members (see Membership page for details of joining ASfAR).